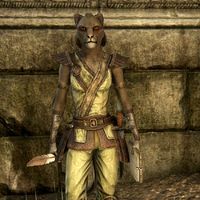 General Atahba is a Khajiit officer of the Aldmeri Dominion found at the Eastern Elsweyr Gate. She is responsible for handing out Battle and Warfront missions. Reporting for Duty: Meet the major players leading the Aldmeri Dominion to victory in Cyrodiil. "Welcome, walker. Grand Warlord Sorcalin has given me her orders. They can be found on the boards alongside me. Good hunting!" Can you tell me about your mission boards? "Which would you like to hear about?" Tell me about Battle missions. "Battle missions send groups of soldiers to capture valuable enemy resources, yes? The farm, lumbermill, and mine around each castle support its war efforts. If we capture those resources, that castle is greatly weakened." "Warfront missions are Atahba's favorites! These are major attacks to capture enemy castles; many brave warriors are needed. Taking castles from our enemies is the key to the Dominion controlling Cyrodiil." What about the other missions? "General Thoron supervises the other missions. He is usually found on the other side of the gate, waiting for new orders from the Grand Warlord." On you have completed a Battle, Warfront or Conquest Mission, General Atahba will thank you. General Atahba: "This one is happy to see you again, and happier still to hear of your success!" General Atahba: "The gods favor you, walker. May your every mission bring glory to the Dominion!" General Atahba: "Atahba thanks you on behalf of the Dominion, walker." General Atahba: "Not every warrior we send out returns to us. I applaud your skill." This page was last modified on 20 January 2019, at 05:24.